It's not every day that a founding member of Wu-Tang Clan makes their way to Lawrence, Kansas. 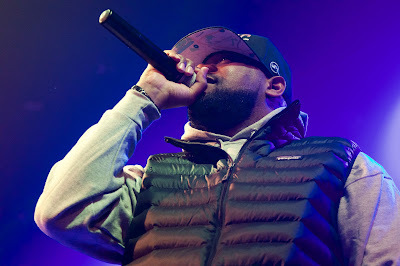 Ghostface Killah (born Dennis Coles) played his first local show in many years on Tuesday night and filled The Granada with fans of gritty golden era hip-hop. The night's local support had concluded when an unbilled rapper named Free Murda took the stage. 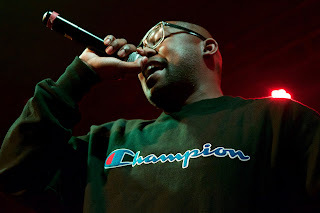 A cousin of several original Wu-Tang members, Murda's 15 minute set at its best felt like a Bobby Shmurda sound-alike and in its worst moments included Murda reciting played-out rhyme schemes over knockoff trap beats. After Free Murda's makeshift road block, Coles took the stage and immediately barked directives at sound and light technicians at the venue, leading some to wonder whether he had bothered to soundcheck earlier in the evening or not. Fans who had waited years to see Coles and hours after doors deserved a warmer greeting than this. Things got rolling eventually, and Coles and his pal Killah Priest jumped into their hourlong set. Coles arguably has one of the strongest solo catalogs of any of the Wu-Tang Clan's 10 members, but to the frustration of fans following his career closely, his performance consisted of a disproportionate amount of Wu-Tang Clan group material. Nearly any member of the Clan can hop on the road and shell out "Protect Ya Neck" or "C.R.E.A.M." and while a Ghostface set wouldn't be complete without some of those, he has released four stellar albums in the past four years that fans didn't even get a taste of. 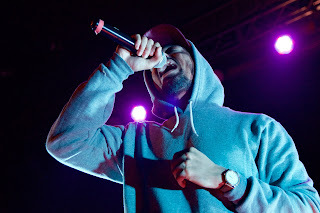 All imperfections aside, Coles still can wreak havoc on the mic. Luckily for him, he's never been known for being a particularly smiley character, so perhaps his annoyances with the stage production played to his advantage in delivering a mean-mugged set. Those who did attend to hear solo material weren't vocal in their disapproval either. Fans went wild for the "Enter The Wu-Tang (36 Chambers)" tracks and two fans even got invited to rap verses from it on stage. The set ended unceremoniously with half a dozen women being escorted onto the stage to dance as the DJ played a couple dancehall tracks while Coles still wandered the stage. His set was one lacking structure, but at the end of the day, a solid technical performance from a nineties hip-hop legend is enough for most people. Veteran Topeka rapper Stik Figa and Kansas City duo BLKFLANL were the night's local support. Stik Figa's lyrical dexterity, unpredictable flows, and effortless delivery thrilled those watching, whether they had never heard of him or drove out from the Top City with him. Stik blasted rap star Lil Uzi Vert in one song, but even Uzi's fans in the room soon knew for a fact that Stik could rap circles around the Philly emcee. One dizzying freestyle of Stik's concluded with his DJ for the show -- Conductor Williams -- proclaiming, "If you can't do that, you can't rap." BLKFLANL -- the duo of rapper Barrel Maker and producer Conductor Williams -- has been working on new material lately and hadn't performed in a couple months. Fans haven't received a taste of that new music yet, but Maker and Williams churned out another well-executed set of tracks from their 2015 record.